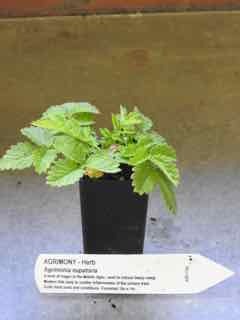 Agrimony plant, Agrimonia eupatoria, was considered a magical herb in the Middle Ages, apparently causing heavy sleep if placed on a persons pillow. Modern folk uses include use of the aerial flower portions as a tea to stop diarrhoea and to soothe inflammation of the of the urinary tract. A hardy plant with medicinal and culinary uses. Agrimony plant is indigenous to Northern Hemisphere and is adaptable to most soils and conditions. Flowers in long lasting racemes during summer. Frost and drought resistant. A perennial plant growing to 2m x 1m. Be the first to review “Agrimony, plant” Click here to cancel reply.